Oil prices continue to hover in the low $50s in the US and low $60s in London – about where they have been since early January. The main issue affecting prices remains the efficacy of the OPEC+ production cut vs. US shale oil production and the slowing Chinese economy. Last week a political upheaval occurred in Venezuela, raising the possibility that Caracas would no longer be able to export 500,000 b/d to the US or that its production might fall below its current 1 million b/d level. So far, the Venezuelan turmoil has not moved oil prices, but with the world’s major powers lining up for or against the Maduro government, prices seem likely to be affected. Last week saw some of the most optimistic forecasts for the future of US shale oil production ever published. Rystad Energy announced that the US is on track to produce some 24 million b/d of oil, more than Russia and Saudi Arabia combined by 2025 – assuming that oil prices stay above $58 a barrel. The growth in US liquids production will be driven by major shale basins such as the Permian, Rystad’s report said. The EIA also joined the optimism last week. In its Annual Energy Outlook 2019, the administration forecast that US crude oil production will keep setting annual records until 2027 and will remain higher than 14 million b/d through 2040, thanks to continuously growing shale production. “Near the end of the projection period (2050), the United States returns to being a net importer of petroleum and other liquids as a result of increasing domestic gasoline consumption and falling domestic crude oil production in those years,” according to the EIA. It seems that the EIA and Rystad Energy are taking the US Geological Survey’s (USGS) new assessment of the resources available in the Permian Basin. The USGS now estimates that over 46 billion barrels of oil, 280 trillion cubic feet of gas, and 20 billion barrels of natural gas liquids are trapped in the Permian’s shale formations. At the end of 2017, total US proven reserves of crude oil were only around 40 billion barrels, so the new estimate adds to that significantly representing a more than 100% and 65% increase in US oil and gas reserves, respectively — if they can be extracted economically. The USGS estimate is of technically recoverable reserves and does not consider cost of extraction. There is much skepticism over whether such massive amounts of oil will ever be produced from the Permian Basin. Outside observers who have looked at the potential of the Permian Basin note that it would take hundreds of thousands of costly wells to extract this oil. Current trends suggest that the costs of shale oil production are increasing as the most productive drilling locations have already been drilled. The OPEC Production Cut: The International Energy Agency said last week that the OPEC+ cuts that started this month are likely to put a floor beneath oil prices, but that it would still take time before the reductions balance the oil market. According to the latest edition of the IEA’s monthly Oil Market Report, Russia produced 11.5 million barrels of crude daily last month and “It is unclear when it will cut and by how much.” Russia undertook to reduce its production by 228,000 b/d beginning this month, with the cuts to last until April, when OPEC+ will meet to review the results of its latest price-boosting effort. However, Energy Minister Alexander Novak warned early on—and recently repeated—that it would be difficult for Russian producers to cut quickly and by a lot. Recent reporting suggests that Russia’s oil production was continuing to climb slowly in January. US oil producers are trying to soothe OPEC’s worries about losing market share, telling the group that investors in the US firms want a reduction in growth and higher payouts. With US output approaching 12 million b/d, OPEC’s forecasts and even US government predictions have repeatedly underestimated US shale oil growth. The CEOs of Occidental Petroleum and Hess Corp, attending a session at the World Economic Forum in Davos, said that growth of US shale oil output would slow. The meeting was a rare occasion when US shale oil producers and an OPEC representative, Secretary-General Mohammed Barkindo, sat on the same panel. US Shale Oil Production: All indications suggest that there will be a significant slowdown in the growth of US shale oil production in 2019. After growing by 1.6 million b/d last year, even the ever-optimistic EIA now is saying that growth will slow to 950,000 b/d in 2019 and to less than 500,000 b/d in 2020. In its monthly Drilling Productivity Report, the EIA forecasts Permian oil production to grow by only 23,000 b/d from 3.83 million b/d in January to 3.85 million in February. That would be the lowest rate of monthly growth the EIA has forecast for the Permian since September 2016. Growth of oil production from the Bakken is forecast to be up by 9,000 b/d next month and Eagle Ford to be up by 11,000. Industry insiders are saying much the same. Continental Resources’ Harold Hamm said that shale growth could decline by as much as 50 percent this year compared to 2018, although he added that it was just a “wild guess.” Hamm said that a lot of shale E&Ps are trying to keep spending within cash flow. Shares of oilfield service firm Halliburton fell sharply last week after the company forecast lower revenues in the first quarter. Clients in North America, Halliburton’s biggest market by revenue, began pulling back on some drilling services last year amid transportation bottlenecks in the largest US production region and after oil prices slid sharply in the fourth quarter. Of more interest is that capital raising by US oil E&P companies has fallen sharply following the decline in crude prices, pointing to cutbacks in capital spending budgets and a continuing slowdown in activity. 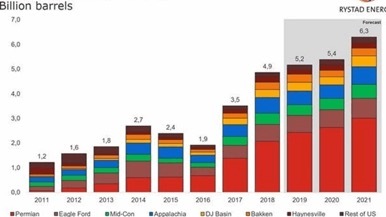 The US shale industry has relied heavily on debt to finance its growth, with E&P companies raising about $300 billion by issuing bonds during the past ten years. As crude prices started to slide last October, that source of capital was choked off, with just three bond sales by exploration companies that month, and none at all since November. For the time being debt and equity investors are encouraging oil producers to pursue cash generation rather than borrowing more to pursue growth. Weak share prices have also been a deterrent to raising capital. With the decline in the growth of US shale oil production, the end of US waivers on Iran, and the OPEC production cut, it seems likely that oil prices will be heading higher this year. The one event that could derail this scenario is more economic problems that would reduce the demand for oil this year. Iran: Subsidiaries of the National Iranian Oil Company signed agreements with Iran-based companies aimed at maintaining and increasing the production capacity of nine aging oil and gas fields in deals worth a total of $1 billion. The agreements are part of a plan to launch 33 projects for enhancing the production capacity at Iranian oil and gas fields. The 33 projects will be worth a total of $6 billion. According to S&P Global Platts, the nine deals are expected to add nearly 90,000 b/d to Iran’s production capacity within the next three years, while the 33 projects are designed to raise Iran’s production capacity by 281,000 b/d. Japanese refiners have resumed imports of Iranian crude after halting purchases because of sanctions by the US. Japan is the last of the four biggest Iranian oil buyers in Asia to resume imports after receiving a waiver from US sanctions that started in November. China and India maintained their imports after November while South Korea halted imports for four months. Syria/Iraq: Before the war, Syria produced 387,000 b/d of which 140,000 b/d were exported. Most of this oil came from Eastern Syria, which is now under the control of the U.S.-backed SDF. Currently, the Syrian oil industry is a shadow of its former self due to the civil war. This provides an opportunity for Russian energy companies, notably Gazprom, to start exploiting the Syrian oil and gas reserves. The instability of the oil and gas regions, however, would require military protection for oil workers. Gazprom may be on track to become the world’s first militarized oil company. Shortages of cooking gas, electricity, and fuel are hitting Damascus hard this winter, prompting Syrian members of Parliament to slam the government for its inability to tackle the crisis. In September 2018, the US Treasury Department imposed sanctions on petroleum shipments and financing to the Syrian government and took additional measures in November against Iran. “The gas crisis is mostly caused by Western sanctions which prevent us from acquiring gas shipments for Syrian homes,” according to the Syrian MP, who also heads the energy committee in parliament. Syria needs to import half of its requirements. Iraq’s Supreme Court ruled that several articles of the law to revive the Iraqi National Oil Company were unconstitutional – effectively sending the government back to the drawing board in its efforts to restructure the country’s oil sector. The verdict strikes down so many key provisions in the law that, to create INOC, the Cabinet will first have to produce an amended draft, and the Parliament will have to re-legislate the new text, according to senior government officials. The Supreme Court also is seeking more information from both sides in a landmark, seven-year-old case before ruling on legal challenges to the autonomous Kurdistan Regional Government’s independent oil policy. In explaining the delay, Chief Justice Medhat al-Mahmoud appeared to suggest the court might be reluctant to rule on the case because of the possibility that disagreements could be resolved by political means. Iraq’s Parliament passed a 2019 budget law last week – breaking through political gridlock by authorizing massive increases in spending, including new revenue guarantees for the autonomous Kurdistan region. The legislation features the largest deficit and the second-highest annual spending in the post-Saddam Hussein era. Saudi Arabia: The International Monetary Fund cut its forecast for Saudi Arabia’s economic growth this year to 1.8 percent, down by 0.6 percentage point from the October outlook, due to lower oil prices and lower oil production. The IMF lifted its 2020 economic growth forecast by 0.2 percentage point from October to 2.1 percent. In November, the Saudis exported their most oil in two years, according to the latest figures from the Joint Organizations Data Initiative, as the kingdom boosted its supplies to offset the re-imposition of sanctions on Iran by the US. Exports are reported to be down in December and January after the US issued temporary sanctions waivers to some of Iran’s best customers. Saudi Arabia isn’t buying into the peak oil demand narrative. Riyadh continues to expect global oil demand will keep rising at least until 2040 and sees itself as the oil producer best equipped to continue meeting that demand, thanks to its low production costs. Saudi Arabia will be the one to pump the last barrel of oil in the world, but it doesn’t see the ‘last barrel of oil’ being pumped for decades and decades to come according to Amin Nasser, president, and chief executive officer of Saudi Aramco. A 30-member Chinese delegation plans to come to Washington this week, US Commerce Secretary Wilbur Ross said on Thursday, as the world’s two largest economies try to meet a March 1 deadline to resolve their trade disputes. Ross tried to tamp down expectations for the talks by saying that while “there is a very large group coming, there’s been a lot of anticipatory work done and we’re miles and miles from getting a resolution.” If a deal cannot be reached by March 2 to increase China’s protection of US intellectual property, curb industrial subsidies and open Chinese markets to US companies, President Donald Trump has vowed to raise tariffs to 25 percent from 10 percent on $200 billion worth of Chinese imports. This year could be different for China’s economy. After growth in 2018 slackened to its slowest pace since 1990 and annual auto sales fell for the first time since that same year, some analysts predict sales will fall further in 2019. Those factors will limit gasoline demand, as will environmental initiatives, such as steps to increase fuel efficiency. Financial services group, Nomura, forecasts gasoline demand growth of 0.5 percent this year, slowing from an estimated 4% last year. At the same time, Chinese refineries will increase production capacity by some 6%, according to Fitch Solutions. China’s refinery throughput rose 4.4 percent year on year to an average 12.10 million b/d, in December, according to preliminary data released by the National Bureau of Statistics. The December crude throughput was down 1.9 percent from November, the third consecutive month-on-month decline since hitting a record high of 12.54 million b/d last September, according to S&P Global Platts calculations. Moscow increased its oil production slightly to an average 11.39 million b/d between Jan. 1 and Jan 22, a source familiar with the Energy Ministry data told Reuters last week. Russian oil output averaged 11.38 million b/d between Jan. 1-10. Under a global oil supply cut deal, Russia agreed to cut its oil production from the 11.41 million b/d it pumped in October. France’s Total will proceed with the development of a new project offshore Nigeria, the Ikike project, Patrick Pouyanné, the chief executive of the oil and gas supermajor, said on Monday. “There is a huge potential in Nigeria, it is probably the most prolific country in West Africa in terms of oil and gas, and it is time to launch new projects and we are working on many of them.” Pouyanné’s comments come a few weeks after Total started up oil production from Nigeria’s ultra-deepwater oil field Egina, which is expected to produce 200,000 b/d at peak output. Nigeria is banking on the startup of its 650,000 b/d Dangote Petroleum refinery to solve many of its economic problems. The refinery is designed for Nigerian crude with the flexibility to process others, and it will meet 100 percent daily Nigerian consumption of all refined products and also would have a surplus for export. The $12 billion refinery and its petrochemical projects include the world’s second largest urea plant with the capacity to produce three million tons per year and the largest sub-sea pipeline infrastructure in the world. Billionaire Aliko Dangote, who built his fortune on cement, said last week that he hoped to finish building his refinery in 2019 and to begin production in early 2020. However, sources who have been on the site many times said they do not expect gasoline or diesel output before early 2022 and even then, many units at the refinery and accompanying petrochemical plant would not be complete. A new report by Nigeria Natural Resources Charter claims International Oil Companies (IOCs)operating in the Niger Delta region steal and siphon large volumes of crude oil from the country undetected by authorities. The report revealed the revenue losses over the last few years and estimated that the government loses some $3 billion annually to oil theft. Although the report does not say how much oil IOCs steal, it, explained that when they do, they always resort to a network of onshore and offshore operators, sellers, and financiers. The crisis in the country finally came to a head last week when Washington and a string of countries in the region recognized Venezuelan opposition leader Juan Guaidó as head of state and urged Venezuelan President Nicolas Maduro to step down. Guaidó declared on Wednesday that Maduro’s government was illegitimate and that as president of the country’s National Assembly, he was assuming power in accordance with the country’s constitution. Almost instantly President Trump issued a statement recognizing Guaidó as the country’s rightful leader. Soon after came similar pronouncements from Canada, Brazil, Argentina, Colombia, Chile, Peru, and others. Needless to say, the move by Guaidó in coordination with foreign powers has set off turmoil. Venezuela’s military seems to be backing Maduro as does Moscow and Beijing which have billions of dollars and a lot of prestige invested in making the Maduro government Russia’s closest ally in the Western Hemisphere. Cuba’s secret police have been deeply involved in protecting the Chavez and Maduro regimes for many years and could be an important factor in the fate of the country. Washington and the Maduro government have broken diplomatic relations, but some American diplomats remain in Caracas. The Trump administration seems poised to back its candidate by imposing sanctions on US imports of Venezuelan crude oil, a move which will leave US Gulf Coast refiners scrambling to replace the 500,000 b/d that is exported to the US. The revenue from these sales represents most of the country’s earnings as the exports going to Russia and China are to repay old loans and do not earn revenue. If sanctions are imposed, flows of heavy crudes into the US are most likely to increase from Mexico, Canada, Saudi Arabia, and Iraq. “US refiners would likely pay a premium due to infrastructure constraints, competition for market share in Asia, and continued OPEC supply limits,” analysts with Rapid Energy Group said in a note Friday. The sanctions would also likely be imposed at a time when heavy barrels are trading at a premium to light crudes. Five years after former president Enrique Peña Nieto ended Pemex’s monopoly and opened Mexico’s oil industry to private foreign investment, the new administration is betting again on the state oil firm PEMEX to turn around the country’s production which is now around 1.7 million b/d, down from its 3.4-million-b/d peak in the early 2000s. Mexico’s new President Andrés Manuel López Obrador—in office since December 1—is opposing his predecessor’s energy reforms and wants a greater role for Pemex in reversing the downward trend in Mexican oil production. López Obrador suspended new oil auctions for three years, shelving one auction that was slated to be held next month. Mexico is not rescinding the contracts that have already been awarded, but López Obrador wants foreign firms to invest and show they can start production from fields they have discovered. Pemex aims to boost exploration spending by some 10 percent annually in order to achieve its production goal. Several foreign firms are making progress with their development plans at newly discovered offshore oil fields but drilling and developing offshore resources takes years to complete. Italy’s Eni had its phased development plan for Area 1 in the shallow waters of the Campeche Bay approved by Mexico in the summer of 2018, with an early production startup planned in mid-2019. Full field production will start in early 2021. Talos Energy is reporting promising results from its Zama appraisal program. A new strategic plan aims to guarantee “the country’s energy security and sovereignty” and aims to raise crude oil production to 2.48 million b/d by the end of 2024. Some observers say an increase of this size is not going to happen. Fitch Ratings estimates that it would take an annual capital expenditure of $15-$18 billion to replenish its reserves. The fuel shortage sparked by government efforts to curtail theft of crude and gasoline by closing vulnerable pipelines continues. The government said Thursday it had purchased 670 distribution trucks amid its fight against fuel theft. The trucks will be able to move 144,000 barrels of refined products. The first 58 vehicles will be delivered in the coming days, 140 will arrive in February, and the full fleet will be in Mexico by the end of March. The government is looking to reinforce Mexico’s fuel logistics system in an effort to avoid disruption amid pipeline shutdowns aimed at fighting gasoline siphoning. The government is looking to reinforce Mexico’s fuel logistics system in an effort to avoid disruption amid pipeline shutdowns aimed at fighting gasoline siphoning. Pemex 1,400 fuel trucks with a combined capacity of 176,000 barrels. moved 12 percent of Mexico’s refined products in 2017 and pipelines 76 percent. Unless the theft from pipelines is confined to certain areas, the additional trucks may not do much good.